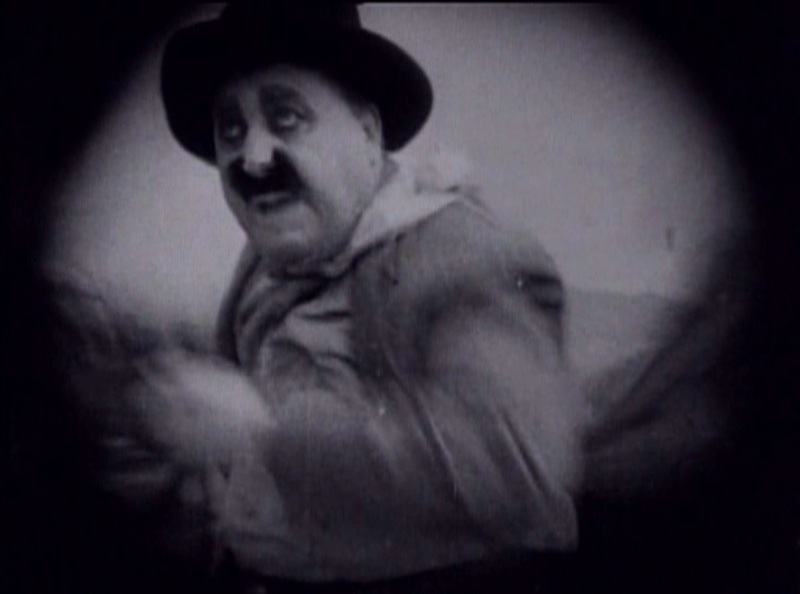 This Sennett-produced short is a rare starring vehicle for Mack Swain, who often played the “heavy” in films with Charlie Chaplin and other comedians. It also gives us a chance to see a more extended satire on movie-going than had been established in “Mabel’s Dramatic Career” and similar movies. Mack Swain is “Handsome Jack,” whose movie is playing at the local Nickelodeon. There’s a good turnout, which is making the theater owner happy, but he gets even more excited when Jack himself walks up and stands next to the poster! Jack is enjoying himself, allowing female fans to “notice” him and swarms of children to run over to see him. The manager invites him in at no charge, and uses his presence to sell more tickets. In the theater, he sits near two couples, and annoys the males by accepting the attention of their dates. A famous Shakespearean actor comes in and snubs him, but most of the audience doesn’t notice, and he gets up to give a little speech before the movie begins. The movie is a simplified Western (from “Thrill’em Pictures”), in which he loses his girl to a slick city boy, only to have to save both of them from an Indian attack. At first, the audience seems to be laughing at Jack’s misfortune and acting, but they get increasingly caught up in the story as it proceeds, nearly everyone (except the Shakespearean) crying when he loses his girl. At the end, he is given an ovation and the girls follow him outside, much to the consternation of the boyfriend of one of them. As he stands over to one side, a matronly woman announces “There’s Your Father!” to the two moppets at her feet. It’s Jack’s wife! She hits him and the disloyal girlfriend, and chases Jack down the street, pausing to knock over a Keystone Cop who had been attracted by the commotion. By 1916, the concept of the “movie star” was pretty well established (though still new), and this movie satirizes some of the irrational enthusiasms people had for their stars already at the time. 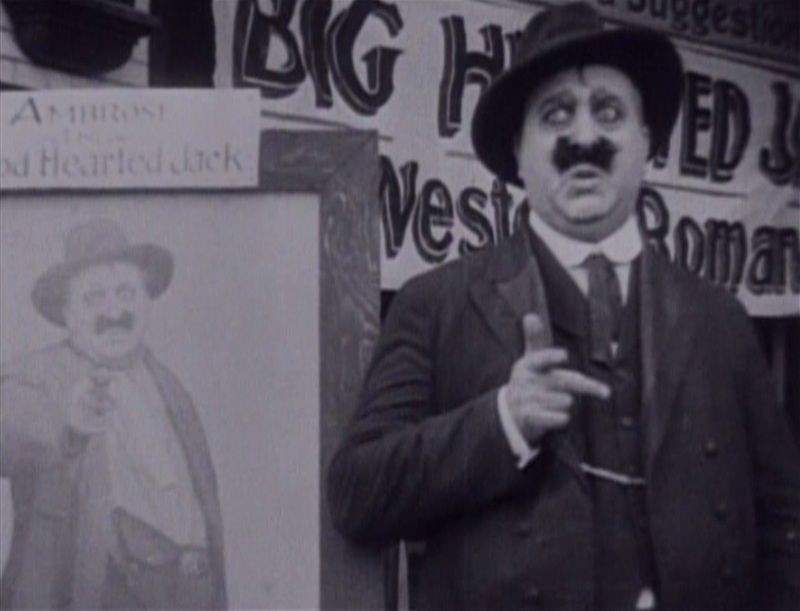 I can’t help but think about how Sennett had lost many of his most lucrative players when they became famous and demanded more money (Chaplin, famously, but also a stream of later actors including Harold Lloyd, Fatty Arbuckle, and Harry Landon). This movie takes film divas down a notch, without actually parodying any of his actors specifically. “Thrill’em Pictures” seems to be a send-up of Kalem Studios, while Swain seems to be portraying the kind of Western star established by “Broncho” Billy Anderson at Essanay. 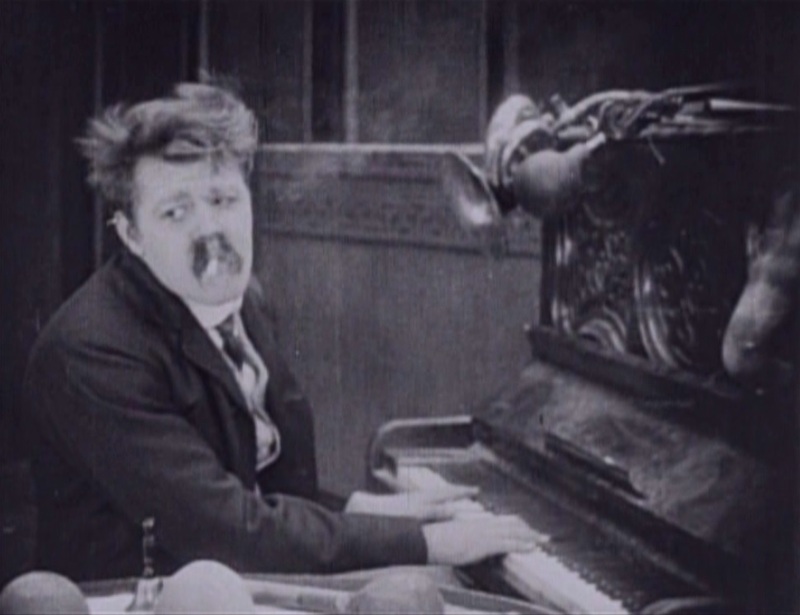 Possibly the funniest part of this movie (to me, at least) was Harry McCoy as the “One-Man Orchestra,” providing piano as well as sound effects for the movie-within-a-movie. He is constantly pulling out bizarre props to make funny noises that go with the film, and also gives a frenetic performance as a musician forced to keep pace with the movie. During the Indian attack, he gets out drums and tomahawks and gives visible “whoops” and hollers. The theater in this movie is still a small Nickelodeon and certainly not a movie palace by any standard, but it does seem rather upscale compared to what we’ve seen in earlier movies that show the inside of a theater. The seats are fixed in place and there is paneling on the walls. 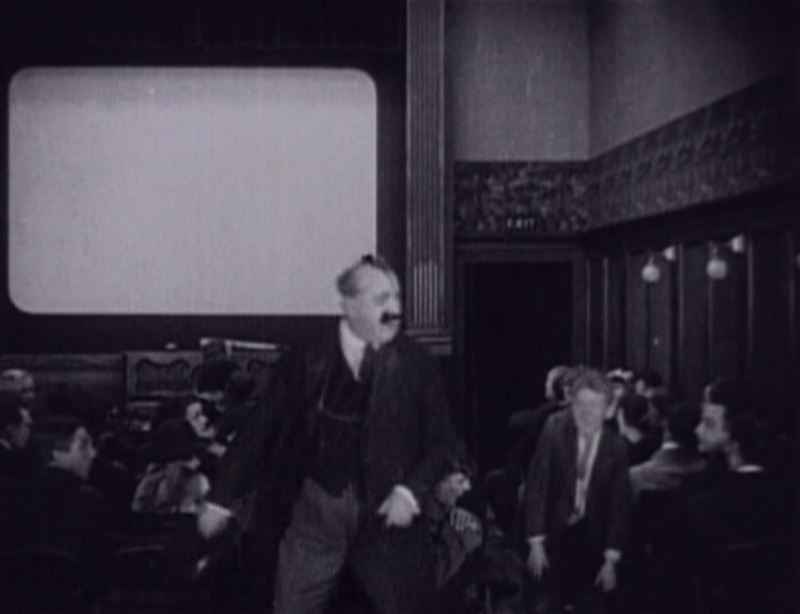 The projectionist seems to have a sizable room to himself, and there is a bit of room to move in the aisles. 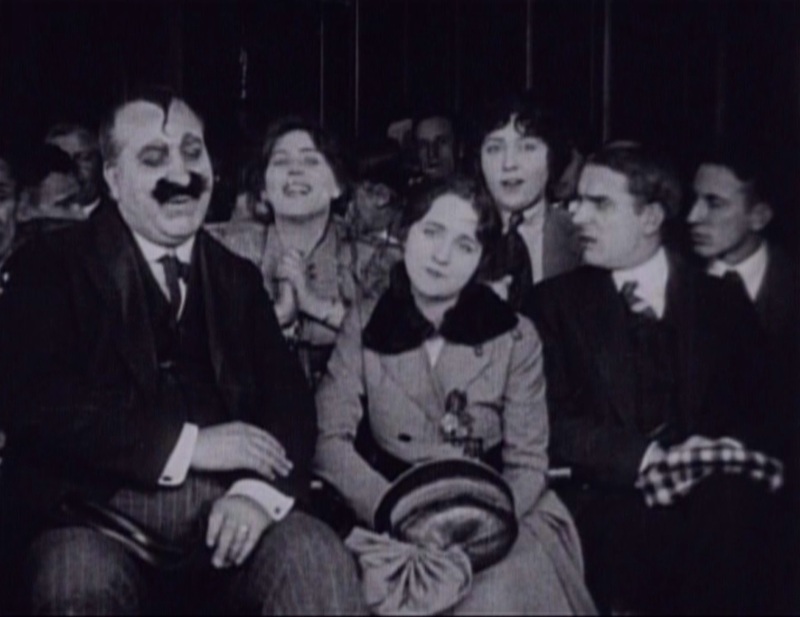 It’s still a bit difficult for audience members to see when a big fellow like Mack Swain sits in the front seat, however, and the framing of the screen during the movie matches “Those Awful Hats” almost perfectly.